Welcome to our report on 'Our Business and Society' for 2005. Social responsibility is core to our business, whether we're helping students achieve the best possible results at school, encouraging college students to become teachers or helping business people make better decisions. In everything we do, our aim is to combine a commitment to our commercial goals with a clear understanding of our responsibilities in the wider world and our performance has continued to improve over the past year. We have seen a terrible succession of disasters and man-made tragedies across the world - from the earthquake in Pakistan and India, to the hurricanes in the US and the terrorist attacks in London. In each case, the spirit and practical response of people all around Pearson was characteristically generous and inspiring. We have continued to develop our relationship with Jumpstart and Book Aid International and we're pushing forward with the work of the Pearson Foundation in the US. As a creative business, we rely heavily on the imagination and brainpower of the thousands of people who work here and we continue to place great emphasis on the need for the makeup of our businesses to reflect the communities in which they operate. Above: This year Pearson and non-profit organisation Jumpstart will create the largest ever shared reading experience. 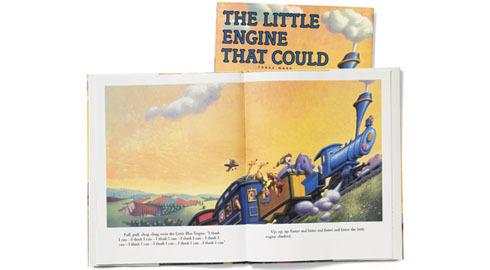 Jumpstart, Pearson's long-term partner in the US, has chosen a special edition of Penguin's The Little Engine That Could to be the official book for the Read for the Record event in August 2006. Each book sold will fund an hour of individual Jumpstart mentoring for an at-risk pre-school child. It may sound like a cliché, but it is true that we believe our people are our greatest asset. For us, corporate responsibility does not belong in a 'box' somewhere out of sight. It is a daily part of what the company strives to be: brave, imaginative and decent in the way it treats its customers, its suppliers, its own people and the wider world in which it operates. The following pages briefly outline how we performed against last year's targets and set some standards for us to reach in 2006. The full report is available at www.pearson.com/community/csr_report2005. Please do not hesitate to send questions or comments to david.bell@pearson.com.